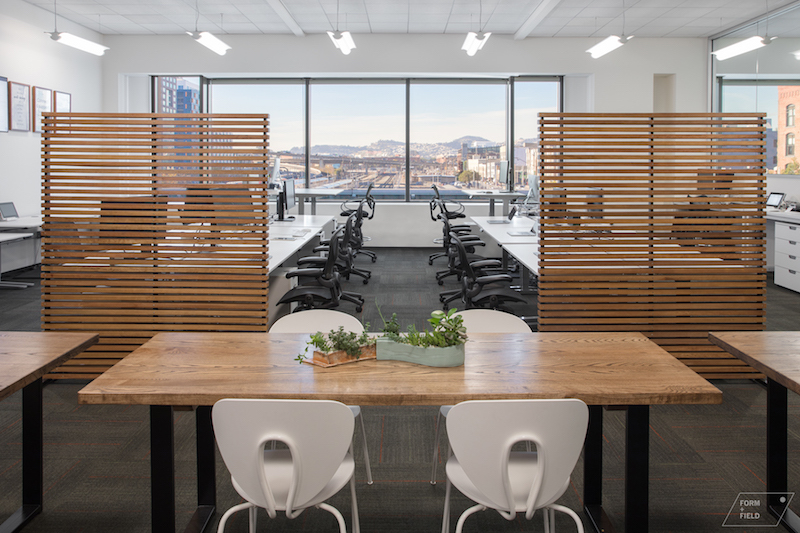 We moved into our new office in San Francisco's SOMA neighborhood a few months ago, and we're excited to reveal the newly designed space to you. The office is located in a former warehouse built in 1907 from salvaged bricks following the 1906 San Francisco earthquake. We love the character and community of small companies located in the renovated building. Here are our tips for making a small office space beautiful and functional. Our needs going into this project were being able to showcase our interior design style, have ample storage, a conference area, and a library. And we had to fit it all in a 300 square-foot space! 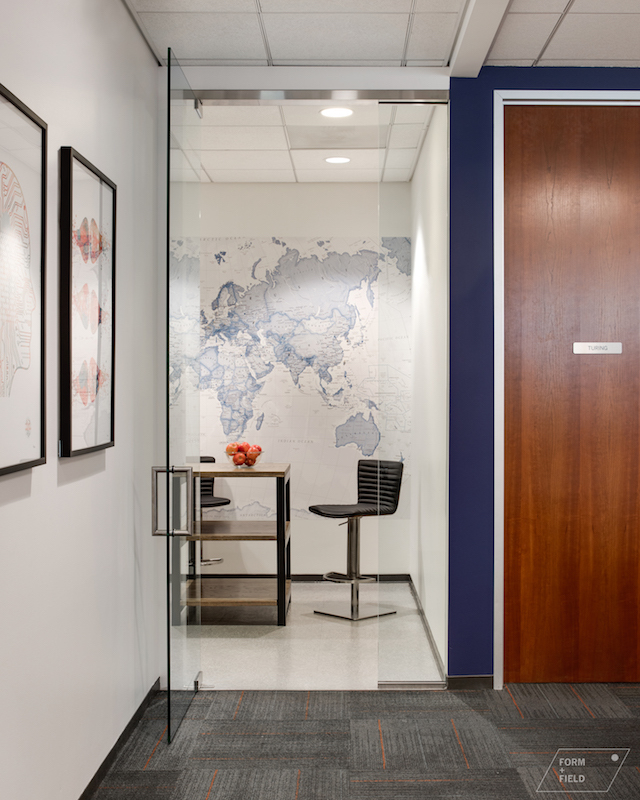 Thinking about vertical space and how to use it optimally was key to making this office work for us. We maximized the back wall storage with tall shelves to showcase interior design materials, samples, and styling props. The shelves are also strategically filled with stacking storage bins and project trays. Use wall space for more than just art. We use picture rail shelves and magnetic boards to store and showcase tile and wallpaper. The TV is mounted on the wall on an articulating arm that can be pulled out for presentations, eliminating the need for a media stand and freeing up floor space. Wall-mounted hooks are used to hang bags and coats. The bookshelf serves as a storage display of books and also a dividing point of work area and conference area. We can access files and reference design books in a cinch. 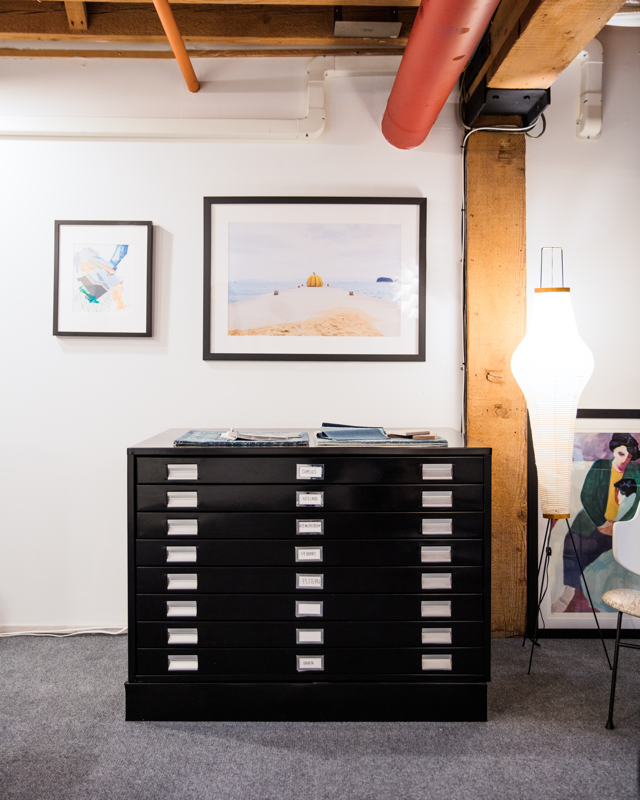 The flat file cabinet and conference table’s large surfaces are also used to display active project samples and drawings. With clean sight lines, no clutter, and a place to keep everything, our office is now the ideal environment to help us stay creative and productive. What are your best tips for maximizing small spaces? Tell us in the comments below.